Let me tell you a story. In 2013 I got the opportunity to write for Forbes. That led to opportunities to get my writing into Time, Mashable, TechCrunch, Inc., and 20 other publications. In 2015 it led to a book deal for Chief Marketing Officers at Work which was published in 2016–Success Magazine event called it one of the Top 5 Business Books of 2016 and it was listed in Forbes recently as one of 11 Marketing Books Every CMO Should Read. How successful do you think I would have been recruiting Fortune 500 CMOs to be part of my book through LinkedIn if my LinkedIn profile weren’t in good shape? Having a LinkedIn profile that isn’t in shape and trying to be a thought leader or an influencer is like trying to date when you’re body isn’t in shape. Is your body an accurate representation of who you are as a person? No. Can you do a good job judging a book by its cover? No. Do we judge people by their bodies, books by their covers, and thought leaders by their LinkedIn profiles? Absolutely. The tragedy with so many thought leaders is that getting their LinkedIn profiles in shape wouldn’t take that much work. We’re not going for the Ironman of LinkedIn here, I’m merely suggesting that perhaps you should comb your hair, brush the potato chips off your shirt, watch what you eat, and exercise a few times a week. Shall we get started? 1. Profile photo. First of all, you better have one. 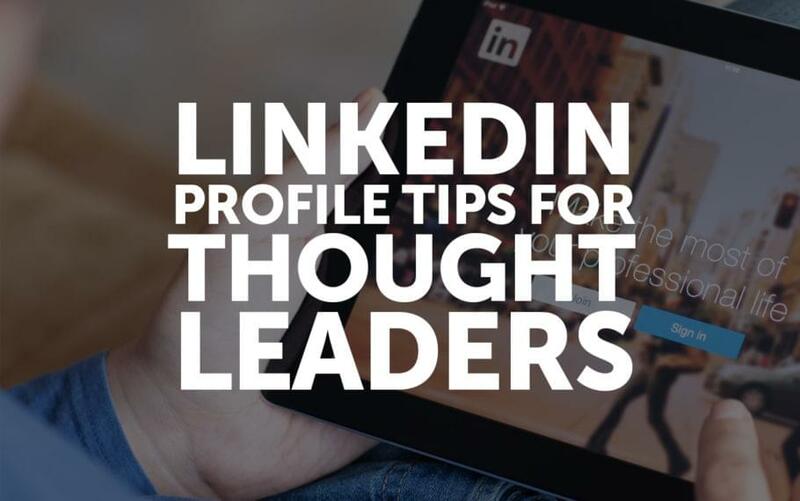 LinkedIn reports that users with a photo in their profile receive 21 times more profile views. Second, make sure it’s a good one. It should be high resolution, with only you in it and nobody else, you should probably be smiling, and it should be the same photo you use on all your other social media profiles and everywhere else people may see you. This is part of building a consistent personal brand. 2. Banner. As with your profile photo your banner should be consistent across your social media profiles. It should be professional and speak to who you are and what you do. It can be used to establish your bonafides or promote social proof that you are a true leader. 3. Name. Don’t use a business name, use your own. If you have a long name with six parts to it, adopt a shorter version of your name for use in business, and use it consistently. I’m “Josh Steimle” everywhere except when my mom is talking to me, when it’s Joshua. 4. Title. You’ve got limited space, take advantage of it. People may not read anything beyond this, so make it sound awesome. By the way, using words like innovative, guru, influencer, thought leader, visionary, and successful do not make you sound like any of those things, they make you sound like a wannabe. If you do keynote speeches, put “keynote speaker” in there. If you’ve written a book, put “author” in. Leave out the self-flattery. 6. URL. Choose a customized URL, rather than a default one. Mine is www.linkedin.com/in/joshuasteimle (go ahead, click it, I’d love to connect with you). But personalize your connection request to say “I read your post on LinkedIn tips…” so I know you’re not just one of the many spam connections I receive each day. 7. Add skills. There’s a limit of 50. Use them all. Make sure they’re relevant. Make sure they’re real skills. “Microsoft Office” is not a skill anymore, that’s so 2001. 8. Ask for testimonials. These are like references, and it’s easier to ask for them before you need them. “Hi boss, you and I haven’t been getting along lately so I’m thinking of getting a new job, can you give me a testimonial for my LinkedIn profile?” Instead, ask for one when it’s an opportune moment, such as at the completion of a successful project. 9. Go public. Sometimes your privacy settings have been set so that when you visit someone’s profile your visit shows up as “Anonymous.” Switch it to public. Then they can see that you’ve visited their profile and they may reach out. 10. Be available. Add your current email address and social media links. Make it easy for people to contact you. 11. Add employment history. Not only does it give detail to someone looking at your profile, but it helps you form connections with alumni of companies you’ve worked at. 12. Add slide decks. Create at least three that focus on your area of expertise and put them on your profile. 13. Like. When you see content that is within your field of interest, check it out, and if it’s good, like it. When you like something on LinkedIn this action is seen by those who follow you. Every once in a while something crazy shows up on LinkedIn, or people post things that are better suited for Facebook. If you’re liking a lot of random things then this will show up to others and they’ll question how much of a focused expert you are. 14. Groups. Join relevant groups. If someone from one of those groups searches and finds your profile, it will show them that you both belong to the same group, which can be an ice breaker leading to a beneficial connection. 15. Connect. You can connect with people you don’t already know outside LinkedIn, it’s ok. Find people who share similar interests, reach out, and be real. But don’t connect with hundreds of people randomly–it won’t do you any good, and can do harm if enough people decline your connection requests and tell LinkedIn that they don’t know you. 16. Share. If you find relevant content on LinkedIn that you like, share it. If you find content outside of LinkedIn that you like, share it. Add your comments, ask for others’ opinions. Get conversations going. 17. Post. Limited to 1,300 characters, but that’s enough to share a brief message and invite discussion. Create posts at least 3-4 times per week. Don’t assume that posts with images work better. I heard Guy Kawasaki talking the other day about how he has tested this out and that posts that are plain text perform better for him than ones with fancy images. 19. Articles. At least once a week write a full blown article on LinkedIn. Go in depth or be short, but be practical and helpful. 20. Video. LinkedIn is rolling out native video. Only select users on mobile have access to it. If you have it, USE IT! This will be highly effective until everyone gets it. 21. Endorse. Endorse the skills of others, and more importantly, give them testimonials. You’ll be amazed at how much people appreciate getting a testimonial from you. So easy to give, huge value for the recipient. These are simple tips. You can implement many of them with an hour or two of work. Those that are ongoing will require perhaps an hour per week, and I know when you’re a busy thought leader it’s hard to find a spare hour, but I can testify it’s worth it. What would you add? What creative ways have you found to build your personal brand and thought leadership using LinkedIn?